Ray believed that great home-cooked food could bring people together. We serve family favorite recipes made with fresh local ingredients. The atmosphere and hearty food make Ray’s the perfect place to relax and enjoy time together. This is a hot breakfast that is self-served, buffet style, and is included for those staying in Conestoga Wagons, Glamping, Western Wagons, Cowboy Cabins, and Cabin Suites. Note: Breakfast is not included for major events such as Ragnar Trail Relay, etc. Located inside Ray’s Restaurant, the Narrows serves plenty of tasty treats to keep you energized on your adventures around the park. Swing by and pick up a freshly brewed coffee, specialty drink, snacks, pastries, or a boxed lunch for a grab and go meal! Hours – Spring/Fall Season – 7:30 A.M. – 9:00 P.M . Enjoy cold drinks (soda, juice), ice cream, snow cones, and other “cold” snacks and food items. Pizza Orders (12pm-6pm. ): Guests may order pizza at the snack bar and pool attendants will deliver poolside. Taste the wild west on a wagon ride through the forest to an outdoor dining location where you enjoy a delicious Dutch Oven dinner. Do you have a special occasion or group event? We offer a wide variety of menu options for all types and sizes of groups. We offer customizable menus for all types of occasions. Take a look at our catering policies and menu and feel free to contact Kourtney our Food and Beverage Manager to book your catering event! 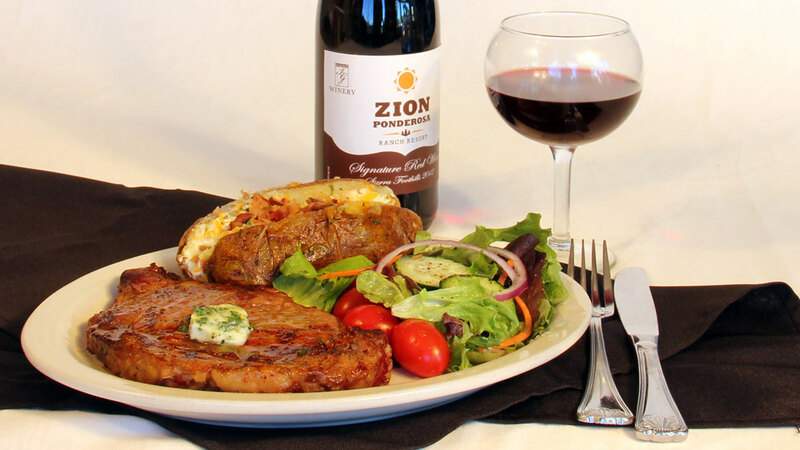 Please Note: Zion Ponderosa Ranch Resort is the sole provider of catering services for those staying in lodging owned or managed by the resort. Outside catering services are not permitted. We cater weddings too! Read more about a recent wedding at Zion Ponderosa.